Do You Know the Difference Between Diet and Nutrition? When we hear the word nutrition, we often think of healthy foods. But healthy foods are really part of the diet. Individual cells can only benefit from good nutrition if the foods in the diet are broken down into building blocks small enough to absorb. These nutritional building blocks must then be distributed throughout the body, absorbed by cells, and metabolized, with crucial nutrients assimilated into the cellular machinery and waste products eliminated. In other words, diet is what we eat, but nutrition is what our cells and tissues actually receive. GNLD’s Scientific Advisory Board understands this distinction well. Nutrients pass through six separate and distinct stages as our body works to support nutrition in each cell. Each of these stages must operate efficiently to attain optimum nutrition for the entire body. Even a slight breakdown in one of the stages could reduce our chances for optimal health. With this in mind, GNLD’s Scientific Advisory Board formulates each GNLD nutritional supplement to support one or more of these vital stages so cells may receive the balanced nutrition they need. A good diet is the first step to ensuring our bodies receive the proper balance of nutrients necessary for optimal health. Diet consists of all the foods, liquids, and supplements that we consume daily. Digestion begins with chewing and includes the action of acids and enzymes. It is the process by which complex foods are broken down into simple substances that the body can use for energy and support of cells and tissues. For instance, lipids, proteins, and carbohydrates are broken into fatty acid, amino acid, and simple sugar building blocks, respectively. Each GNLD product is formulated for easy and complete digestion. Specific ingredients, such as enzymes or nutrients that improve digestion, are included in our products. Additionally, our tableting technologies assure rapid disintegration and dissolution, making tablet digestion easier. GNLD has also formulated a line of digestive supplements to support efficient digestion naturally and to avoid or relieve the discomfort that can accompany incomplete digestion. 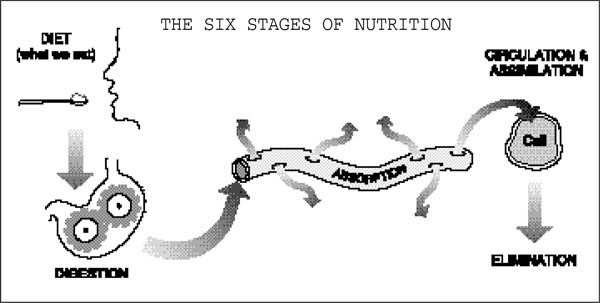 Absorption is the process by which the products of digestion - simple sugars, amino acids, fatty acids, vitamins, minerals, phytonutrients, etc. - pass through the lining of the intestinal wall and are taken directly into the body’s circulatory system. While most nutrients are taken directly into the bloodstream, lipids and lipid-soluble nutrients take a less direct path to the circulatory system. These nutrients are first absorbed into the circulation via the lymphatic system. Each GNLD product is formulated for easy absorption, providing essential nutrients to the bloodstream where they are then carried to all the cells of the body. Transporting the absorbed nutrients to each cell of the body is the role of the circulatory system. We may be eating properly, digesting properly and absorbing nutrients properly, but if our circulation is impaired, nutrients may not reach their cellular destinations. GNLD’s Scientific Advisory Board recognizes the crucial role the blood and circulatory system play in assuring cells receive good nutrition. They have formulated GNLD nutritional supplements to support optimal functioning of the body’s lifeline to health. Assimilation is the delicate process by which nutrients are passed through the membranes which surround each living cell. For the body’s cells to grow, repair, and rebuild themselves, proper assimilation is essential. For this process to take place, cells - especially their membranes - must be healthy. Many scientists believe that aging of organs and tissues occurs when cells deteriorate faster than the body can repair them. Proper assimilation of nutrients is essential for cellular repair. The final stage of nutrition is the efficient elimination of wastes from the body. Elimination begins at the cellular level and is completed through many other metabolically-active areas such as the skin, kidneys, lungs, and colon. It is essential that wastes are completely and regularly eliminated from the body. GNLD products have been formulated to help the cells and the body eliminate wastes efficiently and naturally. Just as all the nutrients used by the body are utilized in combinations, the Six Stages of Nutrition are interrelated. Each one influences the activities of the others. Each GNLD product is formulated to provide essential nutrients and optimal support of one or more of the vital Six Stages of Nutrition.